INTRODUCTION: Breastfeeding can reduce your risk of breast cancer by up to 20%. Recognizing the importance of breastfeeding to mother’s health in addition to baby’s health, Bravado® Designs partnered with Breasthealth.org to help raise awareness of this breast cancer risk-reducing step. In conjunction with Bravado and Breasthealth.org, blogger Ashley Wood, shares breastfeeding advice and recipes for new moms, although the recipes can be enjoyed by anyone. New moms are busy, and finding time to fit in nourishing meals can be a challenge. That said, as a new mom, I always rely on a simple analogy to remember just how important it is to refuel yourself first and foremost – I think of the pre-flight instructions that you hear when you’re on the plane waiting for take-off. When the attendants get to the part about the oxygen mask, they quickly warn parents that if the oxygen masks drop, you must apply yours before attending to your child. It’s that simple – the mother needs to have oxygen to help the child. And that’s a good enough analogy to remember for me when tending to my little one. If a mother isn’t feeding herself energizing, healthy foods then her body may struggle to produce milk for her baby. While this may not be a problem at first, it might catch up on mom sooner than she thinks, and her milk supply could decrease because of it. As a general rule of thumb, I try to take advantage of every single second of naptime by prioritizing and nourishing my body with a healthy meal. That said, as every mother knows, naps aren’t always as long as we like them to be, so preparing my meal needs to be fast and easy. Over the past six months, I’ve developed a few time-saving tricks to make sure that even on the craziest days I’m able to stay fueled and energized. That’s where meal prep comes in! Wondering where to start? I find that one of the easiest ways to make sure I eat healthy, nutritious meals every day is to make a meal plan and post it on the fridge. I draft out what we’re eating for breakfast, lunch, dinner and snacks so I know what to cook when I have limited time to prepare a meal. Keeping the fridge and pantry full of healthy, lactogenic foods makes it a lot easier to grab a healthy bite when you have a moment to munch while increasing breast milk production at the same time. (Lactogenic foods = help increase breast milk production). My favorite foods to keep on hand? Bananas, yams, avocados, strawberries, spinach and kale, sunflower seeds, dates, tahini, oats, rice, raw almonds and cashew butter. At the beginning of the week, I like to pre-roast a bunch of vegetables (Brussels sprouts, sweet potatoes, zucchini, squash), make a large pot of whole grains (rice or quinoa) and prepare a few sauces to store in the fridge. The vegetables and grains act as a base for a really delicious and easy to prepare lunch that I can throw together within minutes. One of my favorite sauces to make is my Easy Tahini Sauce that I can mix in with a variety of different veggies and grains, without having to overthink the meal. 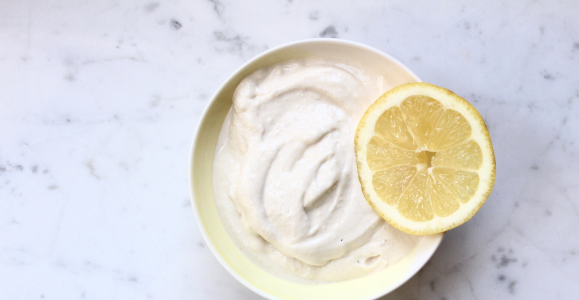 See below for a quick and easy Tahini sauce recipe to whip up! And last but not least, along with proper nutrition, new mamas, drink LOTS of water (hydration is needed for healthy milk supply), rest as much as you can, and while nursing, do your absolute best to enjoy the moment – because all this prep should mean you have more time to relax and connect with baby, feel the bond between two of you and embrace the time you have together! 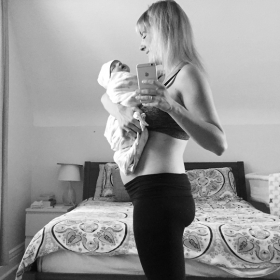 Ashley Wood is a wife and mindful mother to Ivy Bird. She is also a plant-based nutrition advocate and natural health enthusiast. Follow Ashley via Instagram @ashleyraeannewood.